Fru-Gal.org: 20 Free 4x6 Prints @ Target this Week! 20 Free 4x6 Prints @ Target this Week! 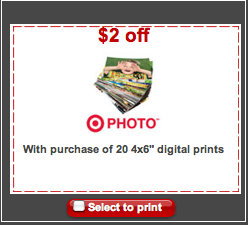 Target currently has a hot $2 off coupon online with 4x6 prints on sale this week for $.10 each, making 20 of them absolutely free! Snapfish is also having a good deal on prints if you need a whole bunch printed.